Back in 1996 the Web was starting to gain some serious momentum, but it was still just a few years old. Now in 2008, looking 12 years back into the past of the Web can be a both nostalgic and entertaining experience. In January 1996 there were only 100,000 websites, compared to more than 160 million in 2008. The web browser of choice was Netscape Navigator, followed by Microsoft Internet Explorer as a distant second (Microsoft launched IE 3 in 1996). Most people used dial-up Internet connections with mighty speeds ranging from 28.8Kbps to 33.6Kbps. Highly modern 56Kbps modems would arrive in 1997. People had only recently started to switch from 640×480 to 800×600 screen resolutions. In 1994, “Jerry’s Guide to the World Wide Web” had been renamed to “Yahoo!”. The Yahoo.com domain was created in January 1995. 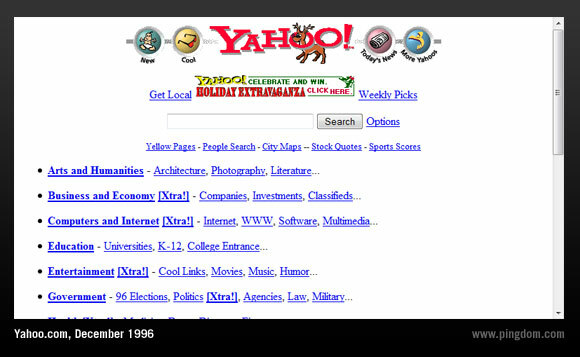 In 1996, Yahoo was well on its way to becoming one of the major Web portals. 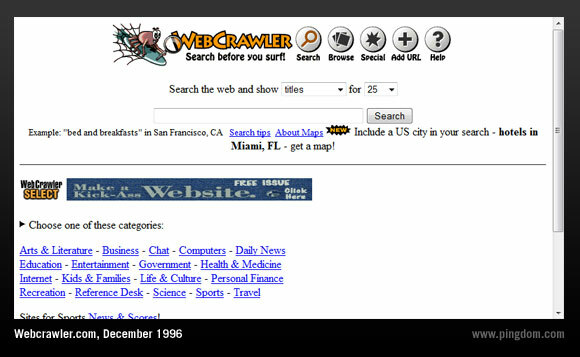 Webcrawler got started in 1994 and was the first Web search engine to provide full text search (making it the first modern-day Web search engine). Altavista was a search engine created by DEC that launched in 1995 and quickly gained massive popularity. 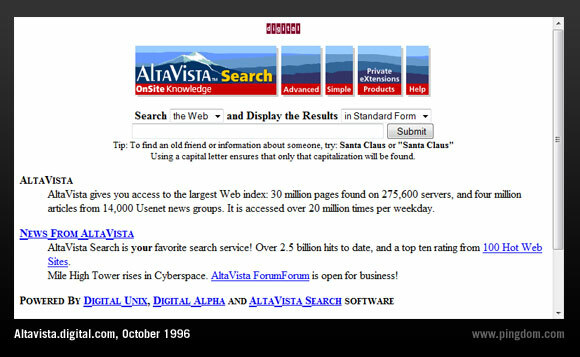 Aside from strong traffic to their own website, in 1996, Altavista became the exclusive provider of search results to Yahoo. 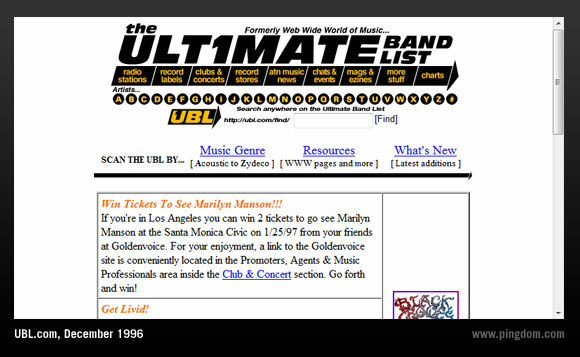 Started in 1994, Ultimate Band List (UBL) provided a popular music database with information about artists, concerts, record labels, and so on. Kind of a Last.fm of the time. Founded in 1995, Lycos quickly grew into one of the most popular portals and search engines on the Web. 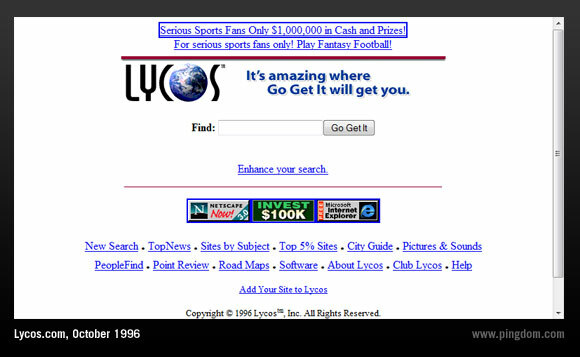 By 1999, Lycos was the most-visited Web portal in the world. Founded in 1994 (originally as Mosaic Communications Corporation), Netscape is one of the true pioneers of the Web. In 1996, Netscape Navigator was the leading Web browser by a large margin. Microsoft had started going after market shares with Internet Explorer, but had not yet gained a firm footing. 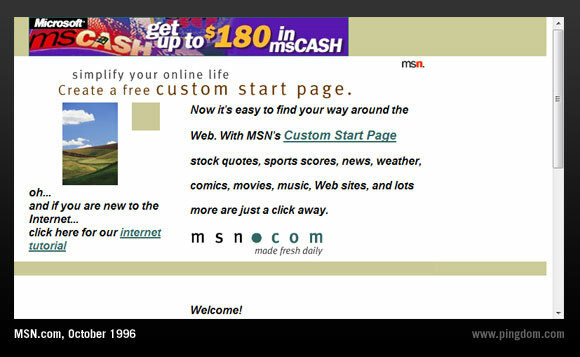 MSN (The Microsoft Network) got started as a set of Internet services in 1995 (it was launched in connection with Windows 95). It was originally intended to be both an online service and an Internet service provider along the lines of AOL. In 1996, Steve Jobs had not yet returned to Apple (he did that in 1997) and the company was losing market shares. Mac OS 8 was on the way (as you can see in the screenshot) and the good old Newton PDA was still being sold. 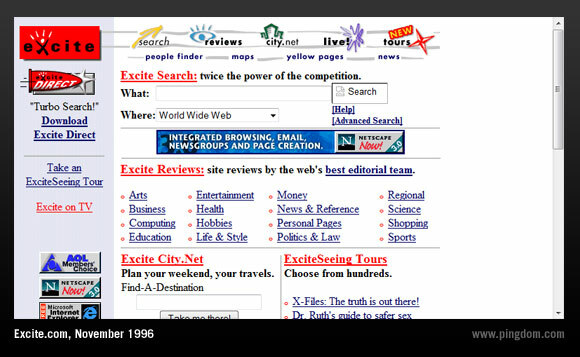 Founded in 1994, Excite was yet another popular player in the increasingly crowded Web portal market. 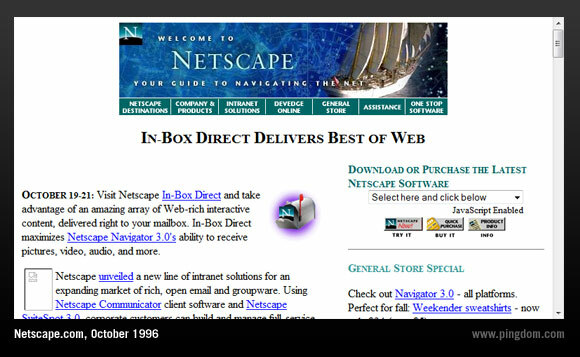 The website itself was formally launched in December 1995. 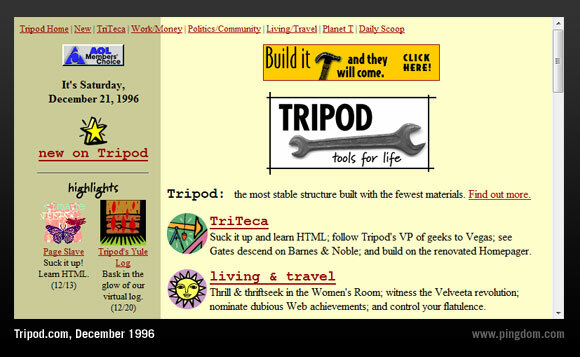 Launched in 1995, Tripod was originally billed as a “hip web site and pay service for and by college students,” but mainly became known as a place where people could create free web pages (à la GeoCities). Tripod would later be bought by Lycos. 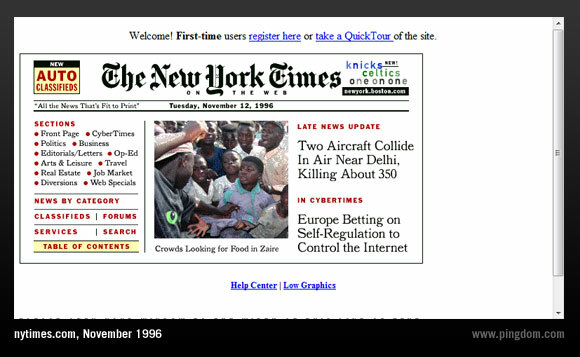 In 1996, the New York Times website was dead set on getting users to sign up to access any Web content at all. Things certainly have evolved a bit, haven’t they? To be fair, the end-user Internet connections of the day would never have been able to handle most of today’s media-heavy websites without them turning slow as syrup, and the relatively fine-grained design control we have these days with for example CSS was not available at the time. 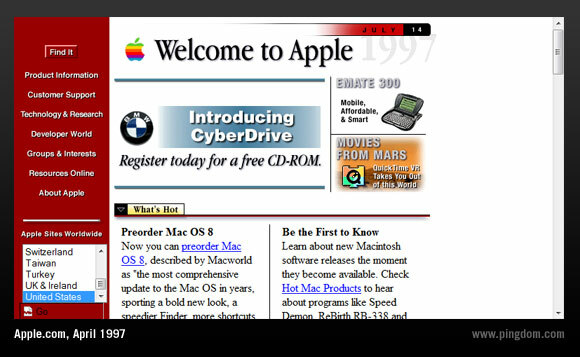 What were your favorite websites back in 1996-97? Share with me!